This book first came out around the time that American Idol was still new. 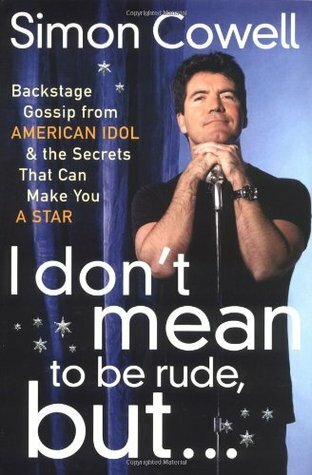 I wanted to read this book to learn about how the reality singing contest first got started and know more about Simon Cowell. Simon Cowell is a music producer and judge for various singing and talent contests such as X Factor, American Idol and Britain’s Got Talent. He is known for his blunt honesty, which can cause upset with the contestants, audience and other judges. Some people hate him for his remarks but I don’t have a problem with what he says. I think he’s just a straight forward person. The book even includes hate mail that people have sent to him. Simon Cowell is the son of Julie Brett (1925-2015) and Eric Selig Phillip Cowell, Sr. (1918–1999). He has a brother named Nicholas and four half siblings John, Tony, Michael and June. The Cowells were an affluent family as the father was a successful estate agent. They lived nearby a film studio and often had celebrities over at their house. Simon wasn’t that interested in school and did various jobs before deciding that he was interested in working in the music industry. His father helped him to get interviews through his connections; which some people didn’t like. Simon worked his way from the mail room to music executive. In 2000, he was approached by Nigel Lythgoe to be a judge in a new reality show called Pop Idol which became so successful that international versions were launched. Simon went on to judge on other reality contests like X Factor and America and Britain’s Got Talent. My impression of Simon Cowell is that he is a hard worker, ambitious and cynical. I think his confidence has paid off for him throughout his career. He was never shy about talking about what he wanted and his persistence paid off. There are instances in the book where he would ring someone non-stop for an agreement. I thought he was also good at spotting current trends and cashing in on them. When the Power Rangers was very popular, he got the idea to produce a soundtrack as well as one for the World Wrestling Foundation. Others scoffed at the idea but millions of albums were sold. I also got the impression that his idea of success is selling a lot of records rather than music as an art form .I don’t think that’s a bad thing because the music industry is a business and he is a music executive not an artist. I think he has a talent for spotting talented artists and finding hit songs. He knew the Spice Girls would be hugely successful and he had wanted to buy Baby One More time which at the time was going to an unknown singer called Britney Spears. He also wasn’t afraid of telling people if he thought they couldn’t make it even when some of them were already famous and wanted to branch into singing. There’s so many artists mentioned in this book and their songs that I went on Youtube to find the ones that were in the book. As all the songs are old now, some are pretty dated but at the time they were quite good. I didn’t watch much of Pop Idol or American Idol when it was on tv so I went to watch some of the episodes he mentioned in the book as well. I think aspiring singers and entertainers would benefit from reading this book. The book features advice for entertainers wanting to become famous. Simon suggests aspiring singers should work hard on their craft; they should know what suits their voice, train, work on their image and find a platform for experience. He lists examples of famous stars who were first actors before they became singers such as Kylie Minogue and how it’s good to have an established fan base. Now aspiring talent have so many avenues to become stars, there’s so many reality contests and there’s always Youtube. I would be interested in reading this and seeing what his journey is like. A lot of people really don't like him, and he is famous for that cruel honesty. I don't mind honesty but sometimes I do think his is a little over the top. But I guess being unique like than and confident is what you need to push forwards and stand out in his type of career!